Only the 04:00 UTC full hour provided any signals of interest, but on the other hand they weren't all that interesting after all. Stations noted were KGYN-OK 1210, KPOW-WY 1260, KGOE-CA 1480. Maybe more interesting stuff will materialise as we check the recordings. OK weather, light to fresh breeze, mostly dry and +1C. 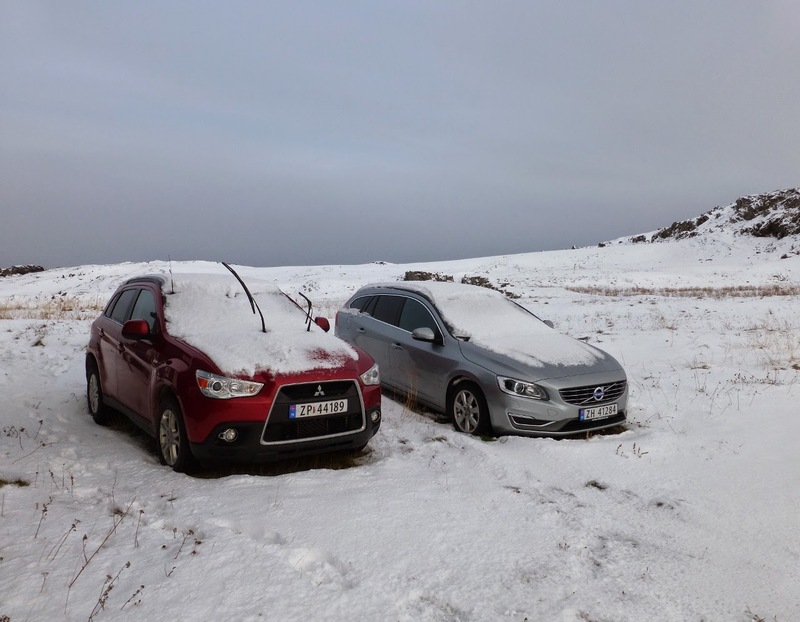 I will leave Kongsfjord for Vadso later on Saturday or early Sunday, so this is the last KONG24 blog post, unless exceptional conditions appear tonight. 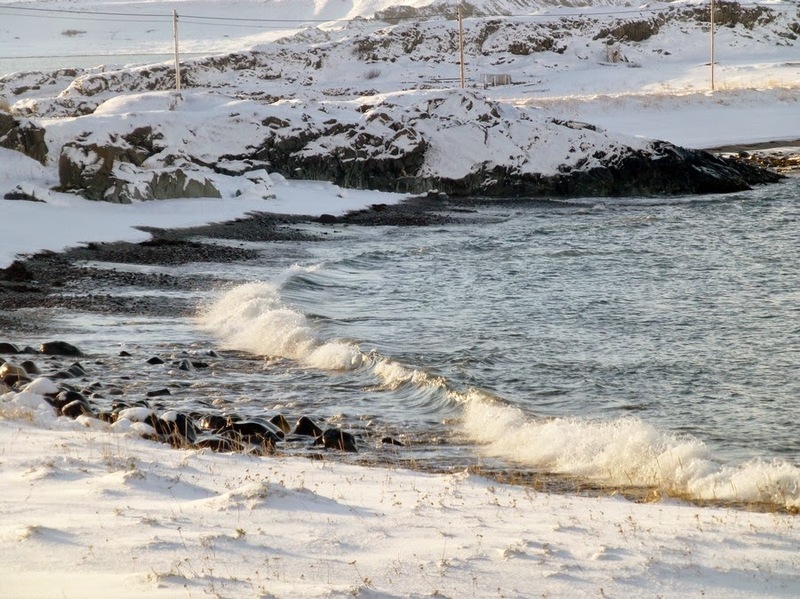 Thanks to all who had the patience and interest to follow us in our Arctic Endevour! Clearly the best night so far! The spectrum below should illustrate this, interesting signals from around 01:00 to 08:00 UTC. With continous recording, there is lots to check so we stayed on 1450 during most of the night and caught some partly interesting stations: KZZJ Rugby ND, KVCK Wolf Point MT, KBMW Breckenridge MN, KATE Albert Lea MN, KWBE Beatrice NE, KGIW Alamosa CO and the big surprise KNOT Prescott AZ before rounding off with KLAM Cordova AK. Quite a handful! Hopefully there will be a few surprises on other frequencies as well. Today was our traditional day of eating out, and as luck will have it the nearest restaurant is only 2 minutes walk away. And they make food like few others. So this is what we had, cod in butter sauce, potatoes, broccoli and carrots. Quite a traditional dish in this part of the solar system. Weather was reasonably nice to us today, a little windy but dry and around 0 Celsius. I had an 8 km road run and really needed my Icebugs on the icy surface. Picture of the day features a different kind of icebugs, our iced-down cars with studded tyres. Very interesting. Solar data said "you're not supposed to hear anything." Not much for very long though. 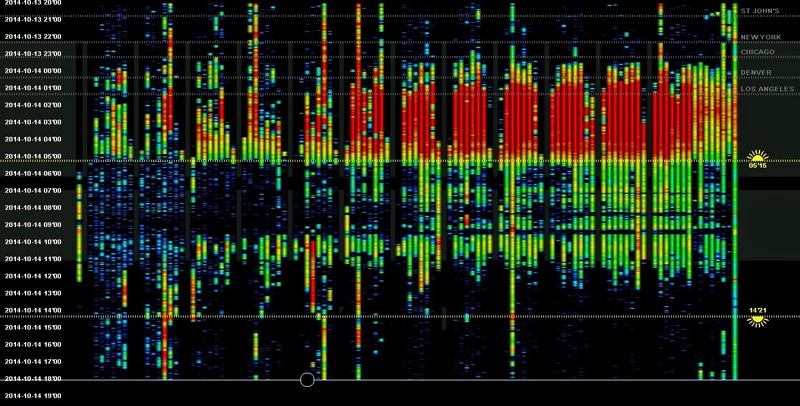 As you can see from the spectrum below, propagation varied a lot, and mostly the interesting bits came at 02:00 UTC with stations like WIBX-NY 950, WDCZ-NY 970, WSOY-IL 1340, WNSW-NY and KTBZ-OK 1430, WBEX-OH 1490 (04:00), WFLR-NY 1590, CJEU-QC 1670 and CHTO-ON 1690. Asia/Pacific was lost in noise. 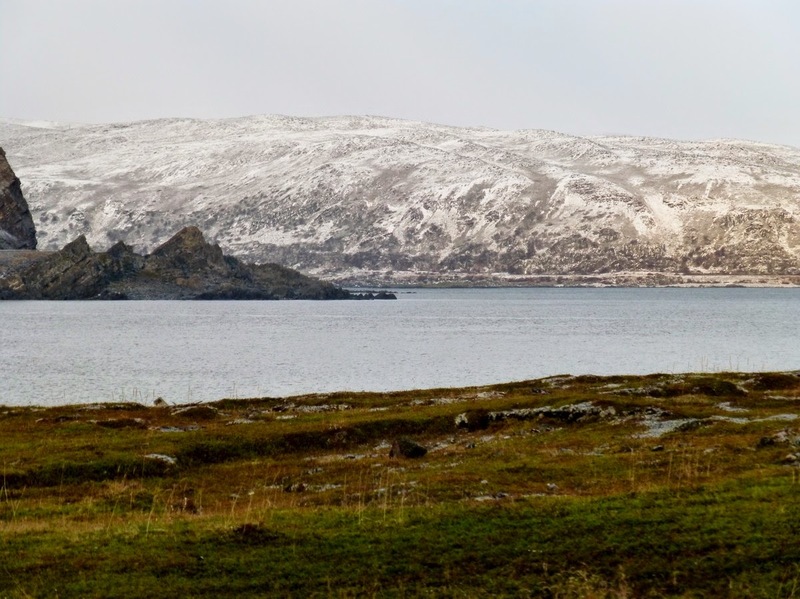 After snow showers overnight, parts of the day was sunny and clear, and the Telenor repair team managed to get the 3G connection working early in the afternoon. Hence the pictures! Dinner tonight was bruschetta with home-made sour-dough bread. The main course was ecologically bred (or so the label said) chicken fillets with woked leek and red onion. Assorted cheese for dessert. 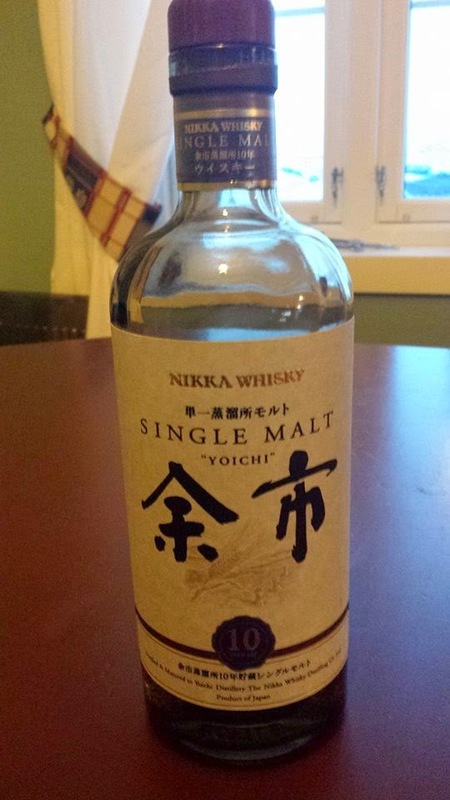 With the cheese we enjoyed a glass of Japanese single malt whisky, kindly supplied by LA9VFA Olav Skår, a good neighbour (albeit 160 km away) but also a whisky connosieur. The picture of the day shows the fine weather we enjoyed at least parts of the day. On October 15, 1974 at 0230 UTC I logged my first trans-polar MW station. It was KJNP North Pole, AK on 1170, fighting with Radio Capodistria, then Yugoslavia. It wasn't necessarily meant to be. I had been introduced to DX-ing two years earlier, and used various domestic radios in this early period. I logged, reported and QSLed a number of SW stations at the time, and it was great fun. However, after two years I thought I had heard what I could hear on the equipment I had available, and in the spring of 1974 interest was starting to wane. 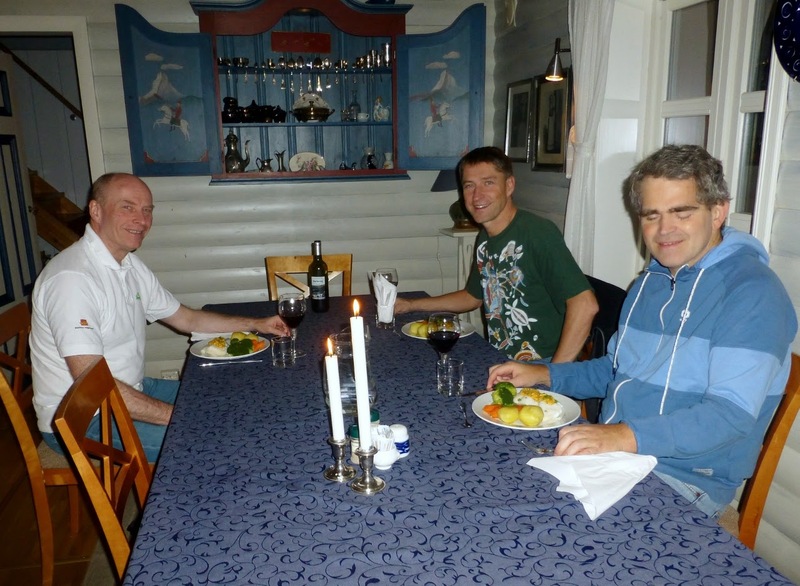 I was persuaded by seasoned MW DX-er Arvid Frøsland to test the coming autumn for North American MW stations. He and fellow DX-er Ole Forr were moving north to Lakselv, not far from where I lived at the time (a mere 6-hour drive...). So I purchased my first communications receiver, the Trio-Kenwood QR-666 and set up a sort of longwire antenna from my 1st. floor bedroom in Berlevag. The QR-666 had terrible readout accuracy, but was very sensitive, and during early autumn I heard many interesting stations from Asia on the Tropical Bands. MW wouldn't open until mid-October, and we were impatient to say the least. Then came October 15, and I was hooked! A new world opened, and US and Canadian stations travelled across the Pole to my modest radio shack at a steady pace. Many hadn't been heard before in Norway, and some not even in Europe. I received QSLs from around 75 North American stations that first season, not even using a tape recorder. The first QSL was not KJNP though. 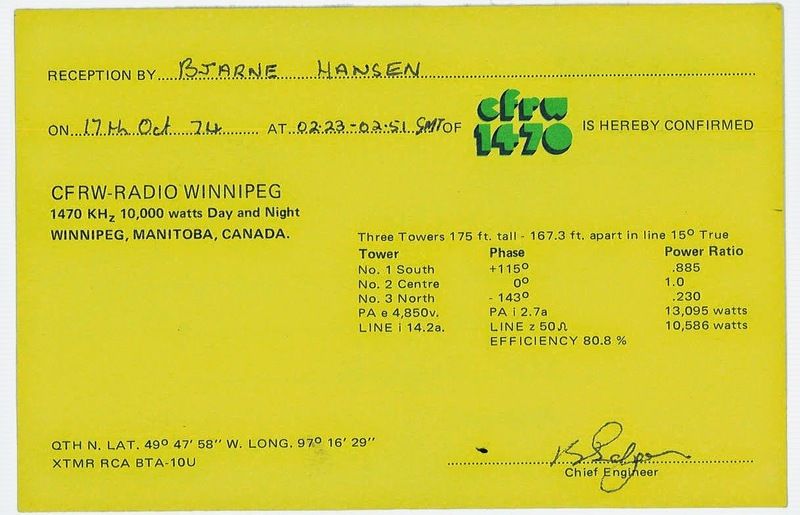 CFRW Winnipeg MB operated on 1470 at that time, and they were very quick to send off their QSL. The QR-666 was replaced with a Yaesu FRG-7 in 1976. Much better readout accuracy, but the way I remember it the QR-666 was better overall. In 1979 I finally had enough money to buy the famous but so expensive Drake SPR-4, every DX-ers dream in the 1970's. It remained my main receiver until 1995, when a modified JRC NRD-515 was bought. A couple of years later it was replaced with NRD-525s, in 2006 came the Icom IC-746Pro and SDR-IQ, and finally in 2008 the Perseus which is still the main rig (I have two). Lot of other receivers have been in my shack; search this blog for details. I've been a bit lazy with regards to reporting stations, a couple of years I didn't do it at all. Still, I reached 1000 North America QSLs not long ago, with Washington highest on the state list at currently 63 stations verified. 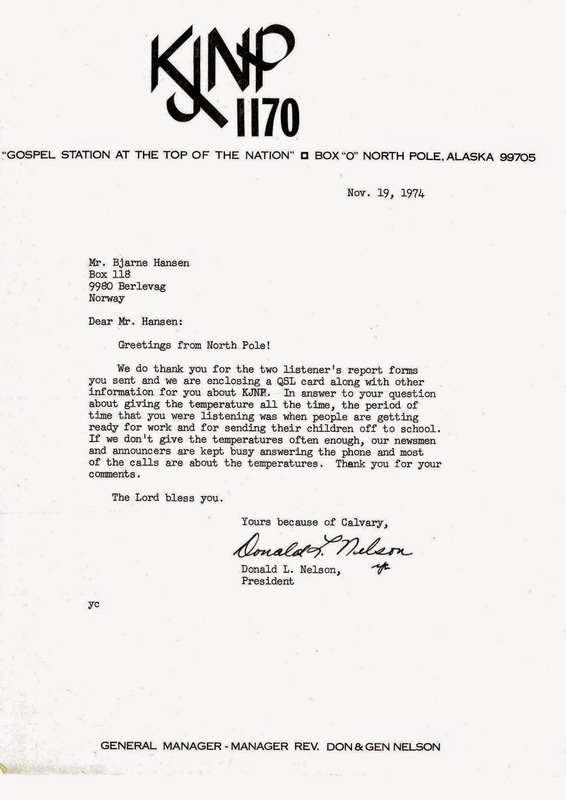 Almost all the stations I heard back in 1974 are now regarded as dominants. And many, especially from Canada, are gone. But KJNP is still there. And CFRW Winnipeg, although the frequency has changed to 1290. On October 15, 2014 at 0230 UTC I tuned in to 1170 to see if KJNP was audible, 40 years after.. It was. And still fighting with Radio Capodistria, now Slovenia. There were little or no changes in geomagnetic conditions which should have triggered these changes. But then maybe we don't have access to every relevant solar data. Nothing spectacular overnight - I noted WUNR-MA 1600 which is by no means an unusual guest here, and many other dominants. Then conditions disappeared, but reappeared at around 10:00Z with a surprise logging of KELY Ely NV 1230. Sadly enough, Arnstein Bue had to leave us this morning to attend matters at work. We usually enjoy a very stable and quite fast internet connection here, however this norning it was all but gone. Only a very slow capacity remained. 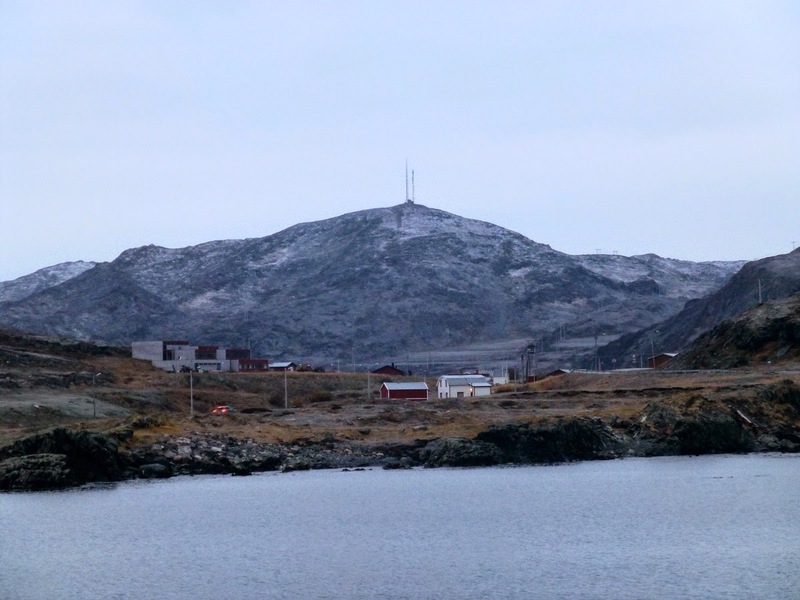 It turned out that they are setting up a new broadcast tower in Kongsfjord, and moving equipment from the old tower, including our 3G connection which is now more like a 0.3G connection. Hopefully things will be ok by tomorrow afternoon. Quite a bit of snow fell during the night, and the wet sleet/snow induced a lot of noise on the beverages - to the extent that the band was covered in noise at times. Here's the picture of the day, taken at around 7:30 am during a lull in the snow showers. 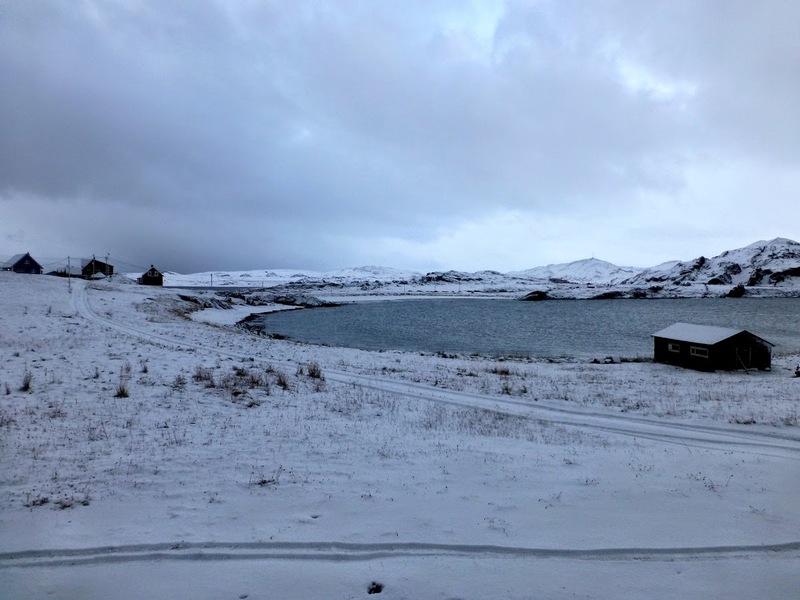 Weather later improved with sunny spells but the showers continued throughout the day and the forecast is more snow. Very good signal levels well into the morning, but when conditions are exceptionally quiet, short beverages like the 310 tend to have a large capture area - so large that there are "too many" stations on a frequency and only the strongest and dominant ones are audible for any length of time. We also had some problems with weather-induced noise. Good signals from some South American stations like Tropical-1040, Caracol-1100 and Santa Fe-1070 and many of the usual eastern and mid-west stations. On the 340 beverage reception was more confined to the western time zones with KACH-ID 1340, KLIZ-WA 1400 etc. heard. The 50 beverage brought very nice signal levels from Radio Kiribati 1440, otherwise it wasn't too exciting. 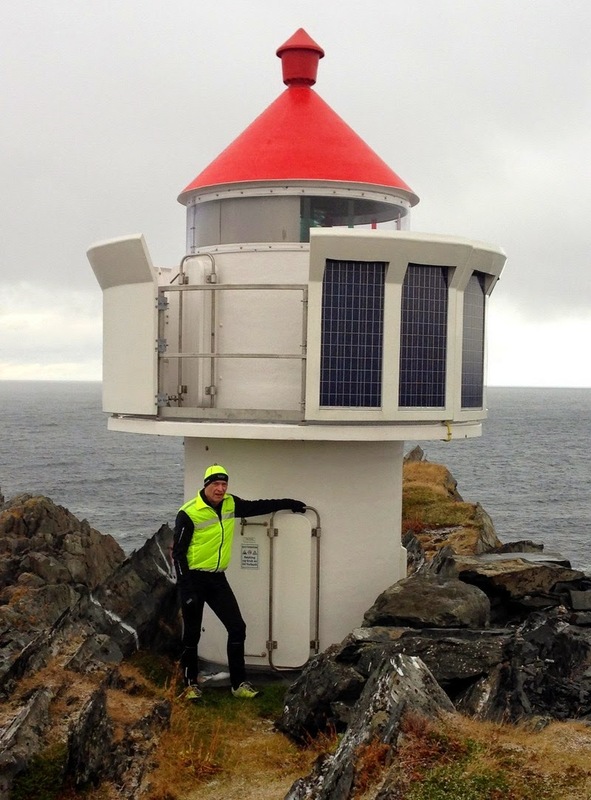 Between snow showers, OJ and I decided to do a 6k terrain run to the Kongsfjord lighthouse, and of course, half-way we were caught by a hefty hail shower. That's me below. Another memorable day dinner-wise. For starters we had King Crab on toast with a mix of mayonnese and red chili. The main course was rack of lamb on a bed of vegetables. Dessert was our "usual" cheese selection, manchego, roquefort papillon, chevre, gruyere, sovrano and a vacherol. For entertainment we had Arnstein's MP3 playlist plus some Youtube videos, including the epic Foo Fighters/Led Zeppelin "Rock 'n Roll" and Pearl Jam/Neil Young "Rockin' in the free world". Picture of the day: Taken during a light snow shower. Still on the positive side of freezing though. By a few decimals. Solar forecast this evening says Polar K-index up to 5, and that's a lot! But maybe we will experience some interesting conditions during the night? Time will tell. A lot better! We're not really there yet, but a dramatic improvement from yesterday as this 310 beverage spectrum shows. The 340 beverage kept the signals going for even another couple of hours. Some of the catches were CJMS Saint Constant QC 1040 (new for me), WJON St. Cloud MN 1230, KWKW Los Angeles CA 1330, KCOW Alliance NE 1400 and KPMC Los Angeles CA 1540. The 10:00 UTC full hour brought local IDs from a number of Japanese NHK-1 stations, including a 100-watt relay from Atsumi on 1584 and JOJP Tsuruoka 1368, 1 kW. Not much from the Pacific, although we did hear Radio Kiribati 1440 and we had a semi-decent X-band opening to Australia at 14:00. Weather is quite nice with calm winds and +2 Celsius. 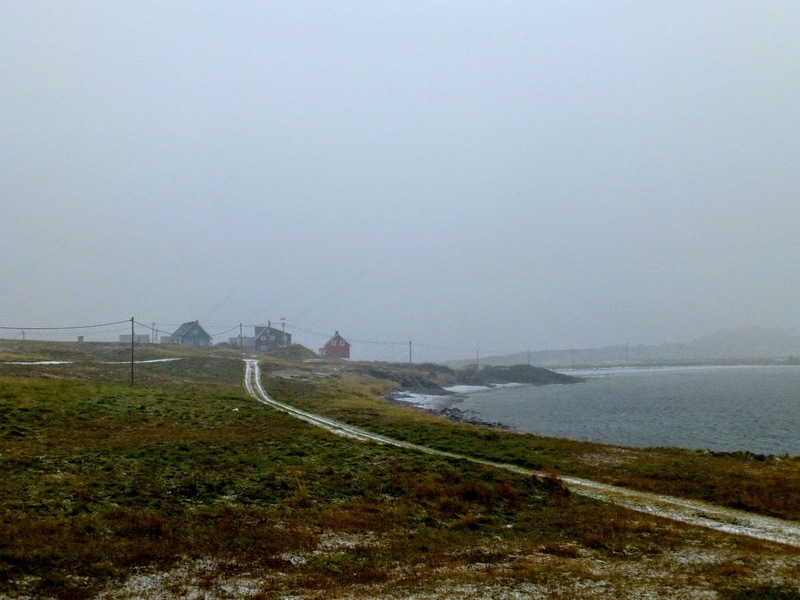 We had occasional sleet-induced noise on the antennas this morning, and this may continue on Monday as the weather forecast warns for fresh breeze with sleet and snow showers. Dinner today was a three-course event. For starters we had baked mushrooms filled with garlic, olive oil and bacon. Of course we needed a good wine for this, and the TreRose Rosso di Montepulciano 2012 did not let us down. The main course is the signature dish of the KONG expeditions, namely the KING Crab. Baked on a salt bed and served with proper pasta carbonara, it's a royal meal. We chose a white wine for this seafood, and the Fernway Sauvignon Blanc from New Zealand was an excellent choice. After a long pause we managed to squeeze in some dessert, almond pudding with red (artificial) raspberry sauce. A little rum and aquavit rounded off the evening. Geomagnetic conditions appear to be good, so we have hopes for the coming night! Below a picture from Sunday morning. A number of PCs, displays, and around 60 TB worth of hard drives is necessary to make things go round. Each of us controls at least two PCs, either by remote desk top or LogMeIn Pro. For internet access we have three 3G subscriptions, average speeds are 17 mbps down, 4 mbps up. A quick description of our antennas (including, literally speaking, an aerial photo) is found here. Arnstein, OJ and TJ arrived by rental car from Kirkenes airport around 2 pm local. Since all antennas and equipment were already up and running, we could all start listening right away. Conditions were exceptionally poor though, with the Japanese super dominant STV Sapporo 1440 barely audible. Later on we did hear traces from 4QD Emerald, AUS on 1548. The spectrum from the previous night on the 310 beverage shows the sorry state with barely audible signals at around 04:30 UTC. Overnight monitoring of the MW band on the 310 beverage. Sun symbol illustrates local sunset and sunrise times. Sunset times for North American cities indicated to the right. 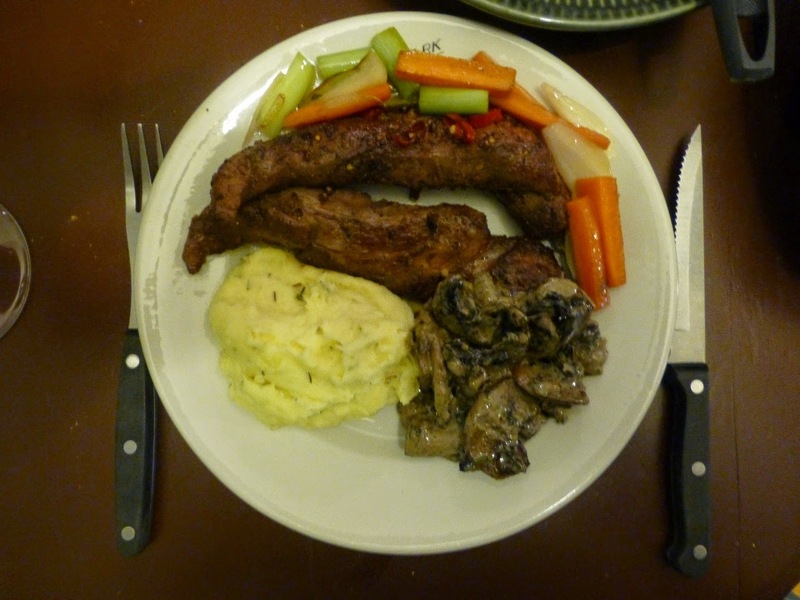 The first dinner on KONG24 had a local main ingredient, namely reindeer meat. This, together with carrots, potatoes, celeriac, onion, leek, swede and red chili was woked and then cooked into a stew with cream and sour cream. Two Langhe Nebbiolo accompanied our main course. For dessert we had the traditional chocolate pudding with custard, and we tasted a couple other wines as well, such as the Allesverloren 2011 and a little surprise for us, the German Spätburgunder (Pinot Noir) from Weingut Mohr-Gutting. At the time of writing this at 01:00 UTC, conditions seem to be on a slow ascent. Geomagnetic data is mostly positive and I hear stations, albeit weak, on most frequency on the upper half of the band. After an exceptionally mild autumn temperatures are now more Octoberish, -2 Celsius last night and around +2 during the day. Absolutely dead calm which is by no way Octoberish. The photo below was taken from my house at sunrise Saturday.